Can we say that “Oh human, thy name is jealousy!”. Well get successful or be adorable by the people and you do not need to make enemies, they will be there automatically. No, we are not being paranoid neither we loose hope. It is about human nature and apart from a few exceptions, people often get sad when they see others getting success instead of their own failure. How can the court of Akbar have all the genuine fellows there then?! There are people who are fond of Birbal including the emperor himself and so does the people who cannot digest the fame and prestige Birbal is achieving merely based on his own qualities and abilities. Mulla Do Pyaza was one such figure, who got jealous from Birbal. Actually Mulla himself was a scholar and witty person. He is considered as one of the nine gems of Akbar’s court. He was also well respected and admired by Akbar and other courtiers for his qualities. The only wrong thing implanted in him is he cannot digest the success, fame and respect Birbal is achieving. He tried a lot to defame Birbal an get him separated from Akbar. However, most of his attempts failed. When he was unable to do the same with his tricks, he thought to take help from someone outside. Akbar enters into his court and sits on the throne. At the same time a weighing scale which was the symbol of justice got disbalanced. When Akbar asked the reason, Mulla Do Pyaza inform him that it happens when injustice is made to any of the citizen. 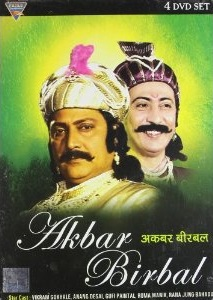 Akbar, who was keen to do justice to all the citizens got fumed over the same and demand the whereabouts of such mishap. Mulla took the chance and asked that there is a remarkable Pandit in the state who is very clever and witty, but never got the exposure and respect he deserve. Mulla also confirms that the pandit got 3 questions which cannot be answered even by Mulla himself. Such witty person should be somewhere in the court of emperor rather then spending time unnoticed! Akbar agree that if the person is having such great intelligence then he must be given the prize he deserve. He also declare that if none of his courtiers are able to answer the questions of the Pandit then he will allot the Pandit the place of Birbal!. Where is the center-point of the Earth? What is the thing which is in possession of everyone including living and dead? Really tough questions….! Phew…! Everyone including the emperor got stunned. No one seems to have answer to the questions. Neither of the nine gems of Akbar’s court got answers to the question. Only Birbal was not present in the court at that time. Akbar was disappointed by not finding his right hand at the time he needs him the most. Of course it is the prestige of the Emperor and his court (which is famous for justice) is in question. Well, how can Birbal let the emperor disappointed? He just walks in – in time. What do you think will happen next? Of course, we expect him to answer the question of the Pandit, but can he? If yes, then what could be the possible answers? If no, then what could be Birbal’s fate? Well, you need to watch the episode to get answers to all these questions. The acting is of course remarkable, as most of the artists belongs to the theater. The outer side of Akbar’s court and palace is filmed on an old castle and the internal is a set. Sometimes the set doesn’t look that authentic. But, the background music, content and acting are the plus points.